As mentioned in Part 1 of this series “How Dual Credit Works for Home Schooled Students,” there are three ways high school students may earn college credit during high school. A little research is necessary. It won’t take long, and you’ll learn a lot and be more likely to make the best decision for your particular situation. Locate the college(s) near you that offer dual credit classes for high school students. On their website, read and understand their dual credit policies. To find them, simply google the name of the school along with “dual credit.” Familiarize yourself with what it would look like if your student enrolled and took a class on that campus. How would it affect our family schedule? Our school schedule? Would I need to be the driver? Would my child focus so much on that class (after all, we’re now talking about a “real” grade on an official college transcript!) 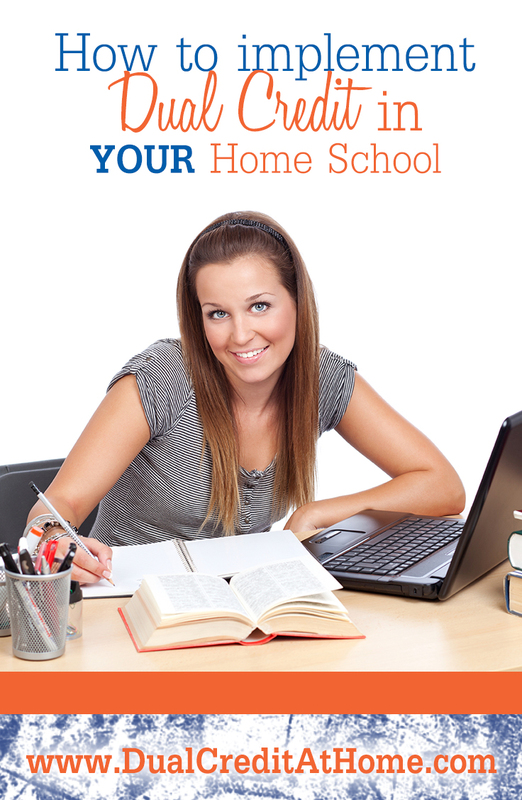 in order to get a good grade that other home school subjects might suffer a little? How might my child be affected by a college environment? There are both pros and cons! What will a dual credit course cost? Even if tuition is waived or discounted, what are the costs of campus use fees and textbooks? Is it worth the time (16 weeks in a classroom) invested in order to learn that one subject? And, if not, is there another way to earn the credits that might not be so costly or time-consuming? Another option for your student is to take an online class. For this your child would stay home and simply use their computer to log in to class and complete assignments. 1. Your teen can take a class from a college that is far away but that would otherwise be unavailable. 2. Your teen is still home so you can take an active role in helping them respond to other worldviews. The main drawback to online classes is generally the cost, so fully understand all costs involved before enrolling. The third way your student can earn dual credit is to take college-level exams. This is the easiest form of dual credit to implement in your home school, and it’s also the way many parents introduce dual credit to their teens. To begin, your student would select an exam to take and then study that subject until they are proficient enough to take and pass the official exam for credit. The most commonly known exams are CLEP (College Level Examination Program) exams, while DSST exams are also commonly taken by high school students. There are also other exam programs that award college credit. Knowing which exams to take and how to study efficiently is perhaps the main concern of both parents and students. Again, consult your college’s website to understand their policies on incoming credits and credits earned by exam. Simply knowing their policies will do away with any fears you may have! Your student can study at their own pace (instead of a classroom pace). Self-paced study can always be accelerated – allowing a student to study a subject in far less time than it takes in a classroom. A subject can be thoroughly learned without so many papers, projects, and assignments. You can choose which books to use, avoiding high priced, current textbooks. The cost of the official exam is far less than the cost of an on-campus or online class. There are dual credit programs available to answer questions and make this process easy for you. A major consideration while earning dual credit is the transferability of the credits. Deciding which school you plan to earn your degree from and knowing what credits will successfully transfer to that school will guide you as you make dual credit decisions. There are accredited colleges that encourage independent learning, and choosing one of them will allow your student to earn even more credits using the exam method than a traditional public university typically allows. Many parents benefit from using a dual credit program – which typically offers support for parents whose students are earning credit using the exam method. As a student starts along a dual credit path, these programs offer guidance as to which exams to take, how to efficiently study, etc. Three such programs are Liberty University Online Academy’s EDGE program, the CollegePrep program, and Dual Credit at Home. The cost for these programs vary from $495 per course through Liberty’s EDGE program, $2,150 for 12 months of CollegePrep’s over-the-phone coaching as your student works through a worldview course followed by CLEP exams at their own pace, and $1096 for 49 weeks of written lesson plans from Dual Credit at Home that take students through a study of 13 core subjects and exams resulting in up to 57 college credits. As you can see, the programs differ not only in their cost but also in their approach. Researching dual credit programs and choosing the one that best fits your family would greatly benefit you. Remember that many students (and parents) have gone before you, and you can learn from what they’ve done! It’s my hope that this information is what you need in order to help your student earn college credits as a high school student – whichever method you choose. Making that happen will go a long way toward easing the transition from high school into college – both financially and academically. Part 3 of this series, “How Dual Credit at Home’s Study Plans Work,” looks specifically at how Dual Credit at Home’s 49 weekly Study Plans (written out lesson plans) turn the dual credit earning process into a doable process for your high school student. As always, email me any comments or questions, or post them below. I love to hear from you!